Everyone knows that Dordt students are obsessed with dating. Well, now it will be even easier to find out who’s dating and who’s still available. Dordt administrators are working on an addition to the directory on Dordt’s student website. 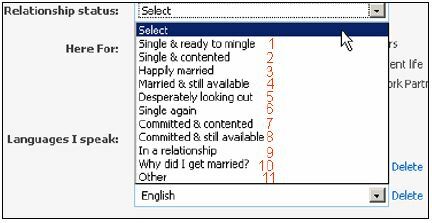 Pretty soon, the directory tell you everyone’s relationship status as well as their major, hometown, and room number. Sandy Reitsma of Computer Services believes that this new element is crucial to the dating game here at Dordt. The Computer Services staff plans to send surveys to every student so that the proper information can be added to the directory. In addition, students will be able to make changes to their status as needed. Doug Tinklenberg of Computer Services says that there will be many choices of status to choose from. Before putting this idea into action, Computer Services had to get it approved by President Hoekstra. However, this was no problem, since Hoekstra supports it completely. Hoekstra also believes that this method is much better than stalking someone’s Facebook page.